Choose one fruit for each color of the rainbow (red, orange, yellow, green, blue, purple). Cut fruit into one inch cubes. String one fruit from each color onto the skewer in rainbow order. Repeat this until you have 12 fruit skewers. In a small bowl, combine the Bisquick mix, milk, and eggs until blended. Separate mixture evenly into 6 small bowls (around 1/2 cup each). Dye each bowl one of the colors of the rainbow (red, orange, yellow, green, blue, purple). Cook pancakes by pouring 1/4 cup of batter onto a hot greased skillet or griddle. This will make two pancakes of each color. 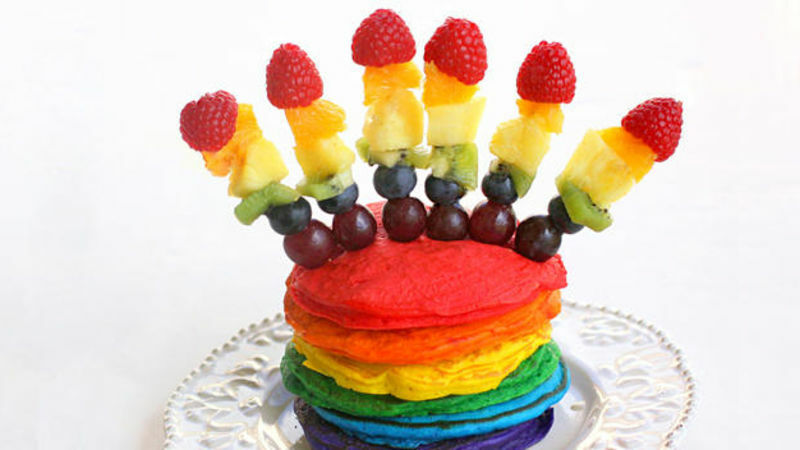 Stack cooked pancakes in rainbow order and insert 6 fruit skewers into the pancakes creating a rainbow shape. Makes 2 stacks of complete rainbows with 2 fruit rainbows. Double Rainbows are all the rage these days, so I thought, "Why not let the breakfast world get in on the fun with a double rainbow delight of its own?" Can you imagine waking up to these Double Rainbow Pancakes? How could you not have a good day when breakfast is literally sunshine and rainbows? The look on my kid’s faces when they saw these Double Rainbow Pancakes was priceless. I know what you’re thinking…these must take forever. Not at all. Just make a batch of pancakes using Bisquick baking mix and divide it evenly in six small bowls. Dye each bowl of batter a color of the rainbow, then start cooking your pancakes. Even cleaning up the breakfast dishes is a little more cheery when rainbows are involved. Of course we couldn’t have just rainbow pancakes…we had to have Double Rainbow Pancakes! When I was at the grocery store, I was inspired by all the vibrant colors of the fruit and thought we could use those beautiful colors to make the “double” in our Double Rainbow Pancakes. Fruit skewers were the only way to go because for some reason, no matter what kind of food it is, if it's on a stick my kids will eat it. I’ll have to remember that next time I try serving them Brussels sprouts. Put a stack of these pancakes on your next breakfast table.